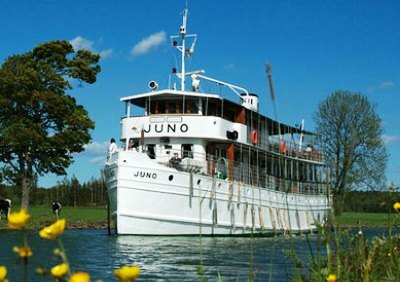 Our Classic Canal Cruise on M/S Juno will take you through exciting parts of Scandinavia! This is a classic route. It´s a perfect way to experience the beautiful landscape stretching from Stockholm to Gothenburg. This classic route has been maintained since the company was founded in 1869. On our journey between the country's two largest cities, you will pass no fewer than 66 locks, eight lakes, three canals, one river and two seas. The cruise includes three nights’ on board with all meals and six cultural stops along the way. 13.15-13.30 Lilla Edet - the lock at Lilla Edet, built in 1916, is the first lock on our journey. The original lock was opened in 1607 and was the first lock in Sweden. 14.45-15.30 Trollhättan locks - the impressive lock staircase at Trollhättan consists of four locks, and has a total drop of 32 metres. Of the three parallel lock systems here, only the biggest one (from 1916) is still in use. 15.30-17.00 Trollhättan - the Trollhättan Canal Museum is located in a storehouse from 1893. Learn more about the fascinating history of the Trollhätte Canal through the interesting exhibition and film shown here. You can also take a walk through the beautiful old lock area. 18.00 Vänersborg - this is the last town before we head out into Lake Vänern. 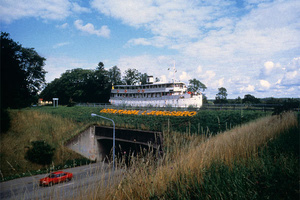 The "Brinkebergskulle" lock is just before Vänersborg. 18.30-03.00 Lake Vänern - 44 metres above sea level. Sweden’s largest lake and the third largest lake in Europe, after the Ladoga and Onega lakes in Russia. 22.45 Läckö Castle - Läckö Castle was built in 1298 as a bishop’s residence. Its golden age was during the reign of Magnus Gabriel de la Gardie, who transformed it into a baroque castle in 1652. 03.00-04.30 Sjötorp - here we enter the first of the 58 narrow locks on the Göta Canal. At Sjötorp we have a set of eight locks and also the remains of some old shipyards. 06.10-08.00 Godhögen-Hajstorp övre - we pass a lock system consisting of four locks in beautiful surroundings. In 1822 the western section of the Göta Canal was inaugurated at Hajstorp. For "early birds" walking is possible from Godhögen to Hajstorp, app. 1.5 km. 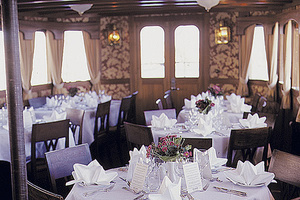 09.00 Töreboda - the railway line between Stockholm and Gothenburg crosses the canal here. 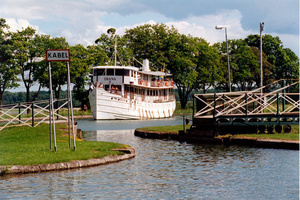 Töreboda also proudly presents Sweden’s smallest ferry, "Lina", which travels back and forth across the Göta Canal. 11.20 The Berg Canal/the Obelisk - an obelisk marks the highest point (91.5 metres above sea level) of the Göta Canal. This part of the canal is called the Berg Canal and originally had a sharp bend which was straightened in 1930-33. 11.50 Tåtorp - one of the canal’s two hand-operated locks is found at Tåtorp. 11.50-14.00 Lake Viken - the beautiful Lake Viken (91.8 metres above sea level) serves as a water reservoir for the western section of the Göta Canal. 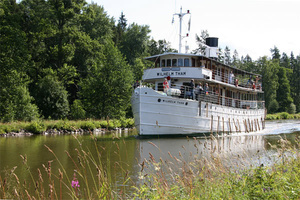 13.00-14.00 The Spetsnäs Canal/Billströmmen - we steer through two narrow, wood-lined passages and small lakes full of water lilies. 13.50-14.00 Forsvik - Forsvik has a very interesting industrial history. The lock, built in 1813, is the oldest one in the canal. The impressive iron bridge dates from the same year. In the lock we are sometimes greeted with songs and flowers by the Kindbom family, a religious group. From here on we will be going downwards! 14.50-17.00 Karlsborg Fortress - we visit Karlsborg Fortress, initiated by Baltzar von Platen and built 1819-1909. The guided tour is a journey through time and space, full of surprises and special effects. 17.00-19.00 Lake Vättern - 89 metres above sea level. Sweden’s second largest lake. 19.00 Arr. Motala - it was Baltzar von Platen who drew up the plans for Motala, and today it is called "the Capital of the Göta Canal". 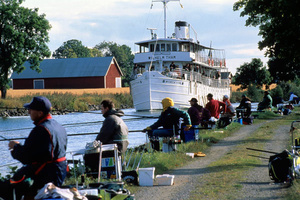 In 1822 an engineering works, Motala Werkstad, was established here to serve the Göta Canal and is today considered to be the cradle of Swedish industry. Here you also find the head office of the Gota Canal Company, responsible for operation and maintenance. We visit the Motor Museum, with its large exhibition of antique cars and motorcycles in authentic surroundings, collection of radios, toys, household appliances and more. You can also walk to see Baltzar von Platen’s grave, about 1 km along the left side of the canal. Overnight stop. 05.30-06.00 Borenshult - lock staircase of five locks where you might hear the nightingale sing. 06.00-07.00 Lake Boren - 73 metres above sea level. 07.00-07.10 Borensberg - Borensberg has another of the canal’s hand-operated locks, after which we see the well-known Göta Hotel from 1908. Just past the hotel there is a small gazebo leaning out over a sharp bend in the canal, known as the "Helmsman’s Horror". 07.30 Kungs Norrby, aqueduct - the aqueduct at Kungs Norrby was built in 1993 and leads over the national route 36. 10.10 Ljungsbro, aqueduct - we pass the second aqueduct on our journey. This one was built in 1970. 10.30 Berg (Heda) - we start our descent in the lock system of Berg (15 locks) towards Lake Roxen. The convent of Vreta dates from about 1100 and was the first nunnery in Sweden. Its importance was later superseded by the convent founded by Saint Bridget (St. Birgitta) at Vadstena. The old convent church at Vreta is one of Sweden’s most interesting, offering many medieval treasures. Today, it is used as a parish church and is therefore not always open to visitors. The tour guide will take us on a walk (app. 3 km, partly uneven) to see the church and the remains of the convent. As an alternative you can walk along the canal or take a swim in Lake Roxen. 12.00-13.00 Berg (Carl-Johan) - The Carl-Johan lock staircase is the longest in the canal with seven connected locks. Here we board the ship again before steering out on the lake. 13.00-15.00 Lake Roxen - 33 metres above sea level. 15.00 Norsholm lock - here the canal crosses the main railway line between Stockholm and Malmö. 16.45-17.15 Lake Asplången - 27 metres above sea level. 18.40-19.45 Carlsborg–Mariehov–Duvkullen - At the lock Carlsborg Övre we have the first of the eight locks taking us down to Söderköping. 20.00-21.00 Söderköping - The idyllic town Söderköping was founded in the early 1200s and was very important during the Hanseatic period. The town also has a long and interesting history as a spa. Söderköping is yours to explore on your own. Don’t forget to try the famous ice cream! 22.20 Mem - Passing through the last narrow lock before Slätbaken, an inlet of the Baltic, we leave the Göta Canal. On 26th September 1832, the Göta Canal was inaugurated at Mem amid great pomp and circumstance in the presence of King Karl XIV Johan and his family. 22.20-07.15 The Baltic Sea - We cross open water for a short bit and then weave through the archipelago in the early morning light. 07.15-07.25 Södertälje - Södertälje lock, 135 metres long, is the largest lock in Scandinavia. 07.25-13.50 Lake Mälaren - 0.3 metres above sea level. Sweden’s third largest lake. 09.00-11.00 The Viking community of Birka - the Viking community of Birka on the island of Björkö is often regarded as Sweden's first town. The town was then an important harbour for international shipping and trade. It was in use for about 250 years and was abandoned before the year 1000. Birka features on UNESCO’S World Heritage list. The archaelogists on the island show us around (app. 3 km, uneven terrain). We also visit the museum. 12.45 Drottningholm Castle - Drottningholm Castle, home of the Royal family since 1981, is also found on the World Heritage list. We pass the castle if time admits. 14.00 Hammarby lock - the final lock on our journey delivers us from Lake Mälaren into Saltsjön. 14.30 Arr. Stockholm, Skeppsbrokajen - our cruise ends at Skeppsbrokajen 103, in the Old Town of Stockholm. Departure from Gothenburg, Packhuskajen 10, at 09:00. Arrival in Stockholm day four at approx. 16:00.